Presenting the 2019 Dodge Durango! Carrying over its five trims of 2018, the Dodge Durango continues to be a versatile and powerful option when considering the midsize SUV segment. Its flexible seating from five to seven passenger capacity is roomy and comfortable no matter two- or three- row configurment. Another plus: with three powertrains across the Durango lineup, you'll find the precise amount of power and capability that'll suit you and your family's travels and hobbies. The 2019 Dodge Durango's fine-tuned engineering has been further enhanced in the new model year. Read on to see the details of this awesome vehicle. People love the Durango's great engine selection and capabilities! For a base engine, already you're getting fantastic V6 performance. The 3.6-liter Pentastar comes either in single or dual exhaust, maximizing output to 295 horsepower and 260 lb-ft of torque. Configurable in either rear- or all-wheel drive, the Durango is designed to suit a variety of climates and year-round weather conditions with superior handling systems such as standard electronic stability control, hill start assist, rain brake support, traction control, speed control, and many others! When properly equipped, this engine can already tow a great 6,400 pounds. If you need more than that, or simply want the great sound and energy that comes from throttling a HEMI, the second engine offered is a 5.7-liter V8. This powertrain generates 360 horsepower and 390 lb-ft of torque, and can tow 1,000 more pounds than the V6. Even this engine is shadowed by the top-tier fastest and powerful 6.4-liter V8 found within the SRT, revving with 475 horsepower and 470 lb-ft of torque. A bunch of high performance systems come additionally equipped within this trim, built with huge Brembo brakes with two-piece rotors, a performance-tuned AWD system, sophisticated active damping system, and a stiffer suspension build compared to the other four trims. This beast can tow a best-in-class 8,700 pounds! Both V8 engines come equipped with a cylinder deactivation system for lower power demanding situations, running the powertrain at four-cylinder capabilities until the throttle automatically kicks in need for the other four. All engines come equipped with an eight-speed shiftable automatic transmission, configurable for either rear- or all-wheel drive but for the AWD-only SRT. 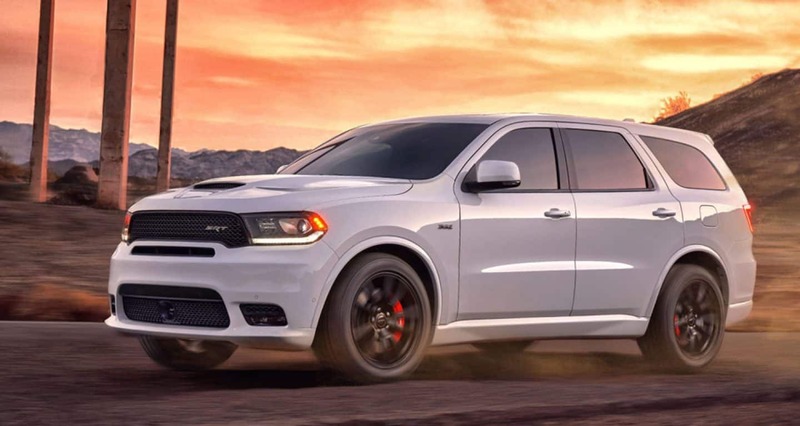 New for 2019, the second-level Durango GT models all gain the specialized performance body design of the R/T and SRT, featuring their aerodynamic front fascia and performance hood with center air inlet duct. A hood design featuring two heat extractors is also available. The champion of luxury, the Durango Citadel's interior is now enhanced with two second-row captain's chairs standard with the bench seat now optional to preserve its seven-passenger maximum. While the towing abilities of the Durango are already above and beyond, Dodge didn't think it quite enough. New for 2019, the Trailer Tow Package now also includes an integrated trailer brake for all Durango models. Finally, broadening the aesthetics of the Durango, 2019 brings three new exterior colors to choose from: F8 Green, Destroyer Grey, and Reactor Blue. Fantastically designed and satisfyingly powerful, the 2019 Dodge Durango meets all the expectations one might have for Dodge's premier SUV. Always performance minded, you can be sure that this American-designed and engineered powerhouse will bring you ample comfort and performance for years to come. For 2019, the Durango maintains its great entry $29,995 price tag. 2019 models are slated to arrive in Fall 2018! Check out our latest inventory to see what we have available for you to experience in person. Feel free to call in to inquire about any questions you may have; our expert staff is looking forward to serve you!